The Sydney Harbour National Park is located along certain parts of the harbour, protecting the natural environs. There are plenty of scenic walks to be had here, green park with fantastic views. There are also beaches to be found. A number of harbour beaches can be found in Mosman, located on the north shore. Three of them have enclosed places to swim, including Balmoral Foreshore Park and Beach, Chinaman’s Beach and Clifton Gardens Reserve. Located at Edwards Bay Road, there is a park and beach, complete with a bathers pavillion. There, there are public toilets including disabled access and tables, great for picnics. There is also a kiosk, and along the main street, restaurants and eateries. Paid Parking is available. If you have a nsw fishing license, there are places to fish as well. A beautiful beach, divided by Rocky Point wraps around the bay here. Backed by a park, there is a playground by the wharf complete with tables for picnics. Places to play cricket and volleyball are on the beach and park. There are toilets, but located at the wharf or the pavillion only, with disabled access. Located on the southern side of Middle Head, there are a number of historical buildings here. You can also go snorkelling and swimming here. Backed by Rosherville Reserve, there is Chinaman’s Beach. About a kilometre’s walk north from Balmoral Beach. A nice, quiet and scenic beach. Great for the kids, there is a children’s playground, large green park, change rooms and toilets. Pay parking is available. Complete with a shark proof enclosed swimming area, the beach here has ample public amenities for a great day out, including a kid’s playground and water fountains. Complete with picnic tables and seating and change rooms, public toilets. Pay parking available. 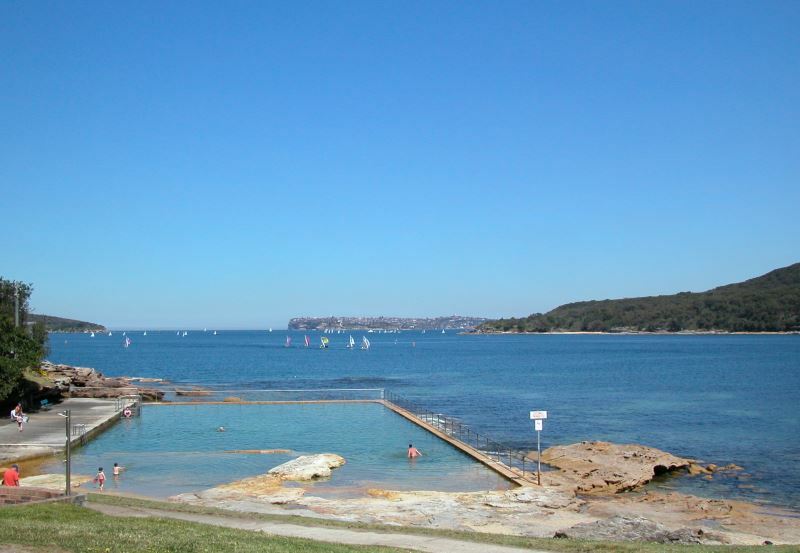 Some of the beaches include shark proof nets, change facilities, eateries and bbq or picnic areas such as Clifton Gardens, Balmoral, Manly Cove and Nielsen Park. In the winter months and days of very large surf some of the inner harbour beaches do get surf, including Manly Cove and Balmoral, due to their proximity to the mouth of the harbour - shown in the picture. North and South Heads are shown in the distance.